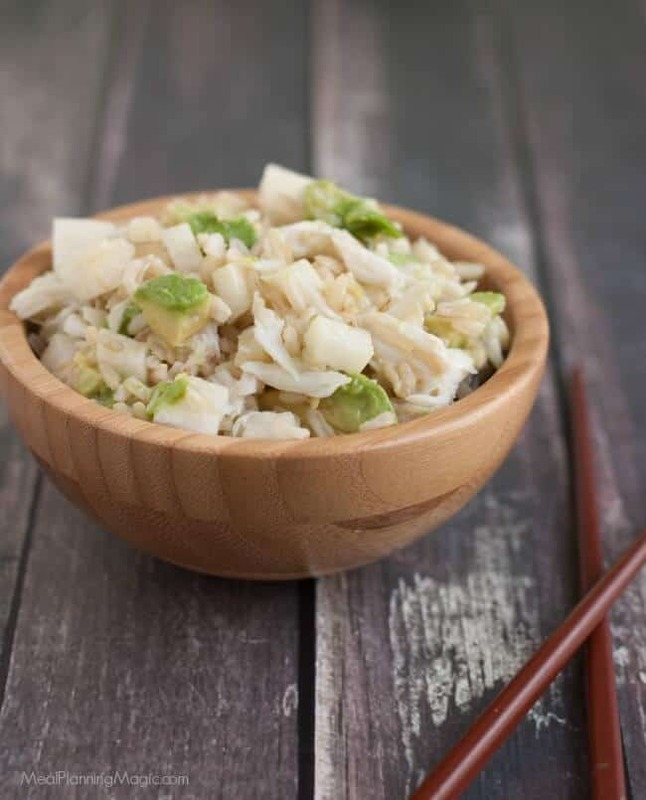 This Jicama Avocado Crab and Brown Rice Salad has an Asian flare to it and is perfect for a light lunch or as a side dish. 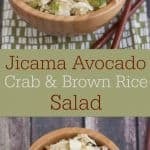 My recipe for Jicama Avocado Crab and Brown Rice Salad originally appeared here almost five years ago as part of my Eating the Alphabet Challenge (that I’m no longer coordinating). I’ve updated the post with new photographs and content a bit but the recipe remains the same. 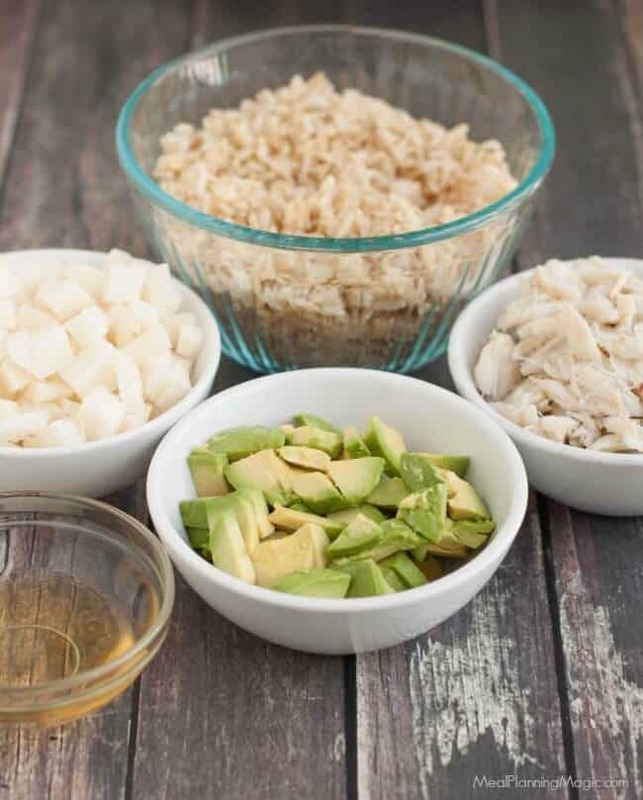 Click here to PIN this Jicama Avocado Crab and Brown Rice Salad recipe! Very often, you’ll likely have leftover jicama as even if you can find a smallish one, they are still somewhat large. So I normally peel and slice up the rest of it into sticks, put in a container and filled with water to keep in the refrigerator. The reviews from my family have been mixed: my son described it as the texture of a pear with the taste of an onion (?!?). My daughter, I think, really wanted to like it but was just not quite sure where to place the flavor. It is sweet but not like a fruit so I think that threw her off–her jury is still out! For me, I just couldn’t stop munching on the sticks—just plain! They are sweet and crunchy–yum. Now on to the salad. 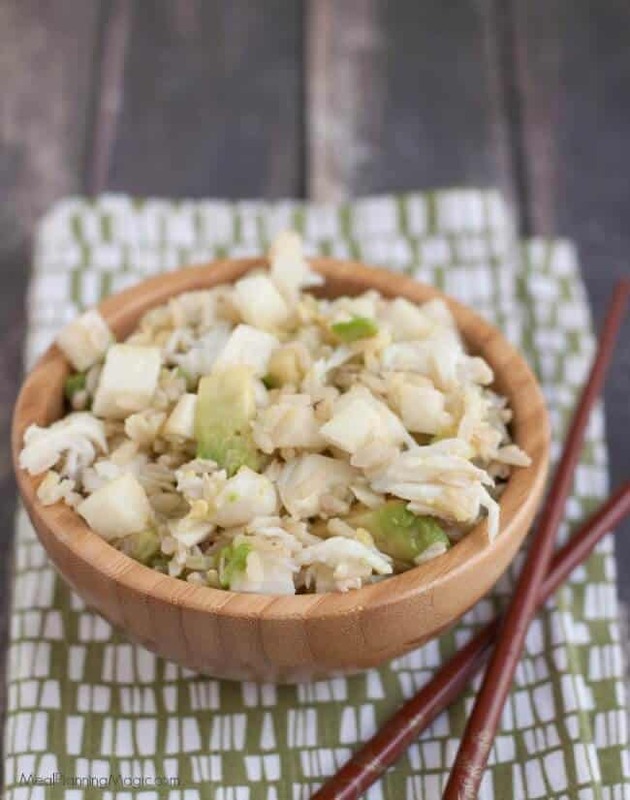 If you like California (sushi) rolls, you’ll like this Jicama Avocado Crab and Brown Rice Salad! It’s got many of the same ingredients as the rolls but with out the outer seaweed wrapper. Plus, it’s a whole lot easier to make with only a few ingredients. You can make it with brown or white rice. We like brown rice so I usually opt for that. The original recipe had imitation crab as one of the ingredients but I will sometimes splurge and buy the lump crab at Costco. You can use the extra crab in either the Cheesy Crabmeat Canapes or Quick and Easy Seafood Creole. This salad also calls for mirin, which is a Japanese rice wine similar to sake but a lower alcohol (non-existent almost to me) content and a high sugar content. If you want something a little more tangy, opt for rice wine vinegar instead. I bought the mirin at a local Asian food market, but you may be able to find it in the Asian aisle of your grocery store. I know for sure the rice wine vinegar can be found with all the other vinegars at the regular grocery store. 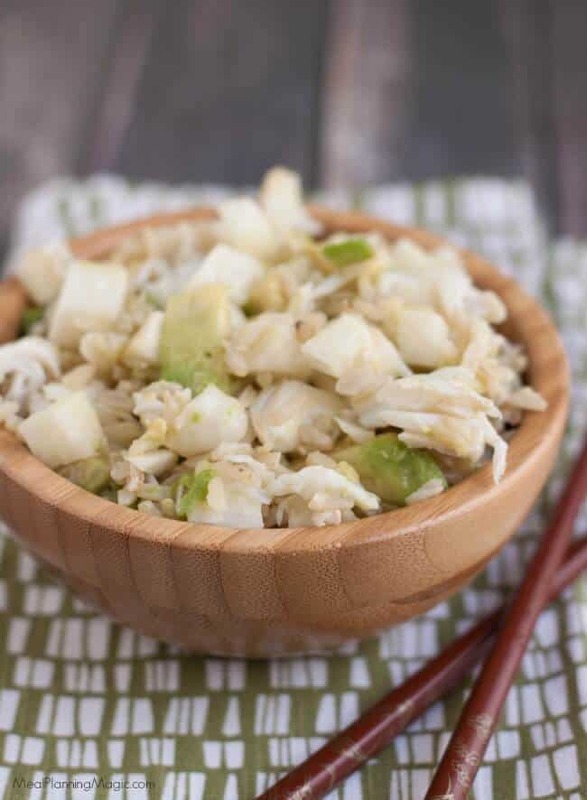 While this Jicama Avocado Crab and Brown Rice Salad can be made a few hours ahead, I would recommend you serve it within 4-6 hours of preparation, otherwise the avocado can turn brown and get a little mushy. This recipe is adapted from a recipe on Star Chefs. Cook the rice until the water is absorbed. Peel the avocado and chop into small pieces. Place in a medium salad bowl. Cut up each crab stick into 5-6 small pieces (I cut them smaller b/c I wanted more chunks). Add to the bowl. Peel and cut up the jicama into small matchstick shapes or tiny dice. When the rice is cooked, turn it into a bowl to cool. When just slightly warm, add the mirin and vinegar and mix. Then add rice to the bowl with crab and vegetables. Just before serving, sprinkle the sesame seeds over the salad. It's a great side dish for Asian marinated meats or as a salad on it’s own! I’ve seen jicama at the grocery store, but was too intimidated by its strangeness to bring it home 🙂 I think I’ll give it a try now. see that is totally crazy, I would have made something with Lemon Jello, that is as creative as I get I tell you! Looks great, Brenda! Good for you, making it even though you weren’t sure your kids were going to like it, and good for them for actually trying it! You’re brave! I’ve never had enough courage to try cooking with jicama … perhaps you’ve provided the encouragement I need. 🙂 So glad to have joined this challenge … it’s fun!! This looks amazing!! I’ve never ever been brave enough to cook with that! The only time I eat it is if it is in a salad. This sounds absolutely delicious! I def will have to try this soon! Thanks for the recipes! This really looks good. I’ve been interesting in trying jicama for ages! Thanks again for hosting. This one is great. Never tried Jimaca. Can do so now. This sounds yummy and what a great idea. I signed up, but have not heard anything as of yet. Thanks! 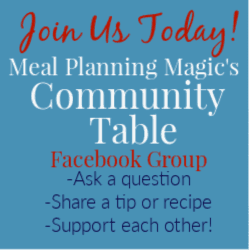 I normally send out an update the last week of the month–so that will be next week! Looking forward to having you join us. Hi Cathleen! If you would contact me viat my Contact Page with more details that would be great! Thanks!